It has been really fun to hear your feedback about the cookbook. After the whirlwind of creating the cookbook, I had no perspective on what it would be like to see it for the first time or get acquainted with its recipes. Most everything in the cookbook is so familiar for me that I had no idea which recipes were going to call to you. I have been really interested in what you are telling me you have tried. For example, I love the beet soup recipe but didn’t expect it to be as popular as it has been. 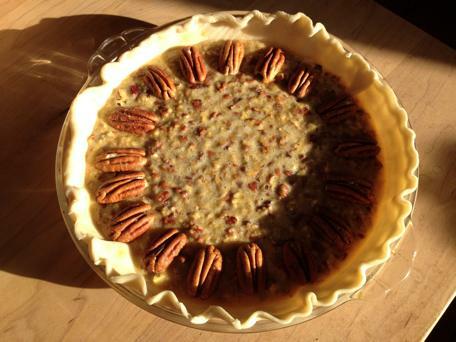 I expected everyone to gravitate to the dessert recipes but this hasn’t been the case- I do hope you go there at some point- The recipe for my mother-in-law Mary Ann’s Pecan Pie for example is so easy and scrumptious. 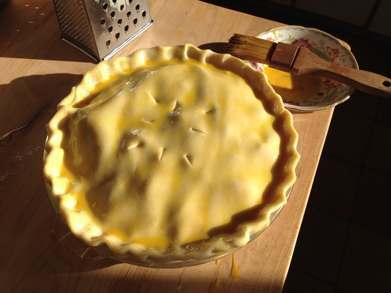 The only tricky part of making it this year was waiting for the sun to come out to take a photo of the unbaked pie waiting its turn for oven space. Oven space was in short supply because Ben and I got a little ambitious with our dinner plans for the big family reunion dinner and did a Feast of the Seven Fishes. The oven and cooktop was log jammed for two days. Seviche, Gravalax, Herring Salad, Ben’s Crab Rangoon from the cookbook, Shrimp and sausage gumbo, baccala, and oysters were our seven fishes. We are thinking maybe Feast of the Four Fishes next year….Seven is a lot of fishes! And the raw oysters shown here at the spread are shown very small as they are not terribly attractive unless a food stylist works on them (none on staff….so far though everyone is fighting over who gets to be the hand model). Anyways, back to the pile up at the oven. 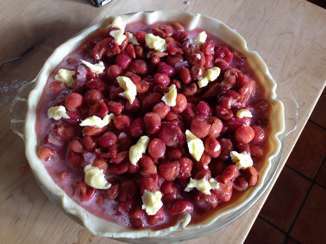 We also needed to make a second pie, and Sour Cherry Pie was the choice. Luckily I had the recipe right in front of me. This pie is Emily’s favorite pie. Note I have already spilled water on this page of the cookbook. Good thing I can locate another copy if things get dire and I light my copy on fire or pour hot molten maple syrup on it or something. 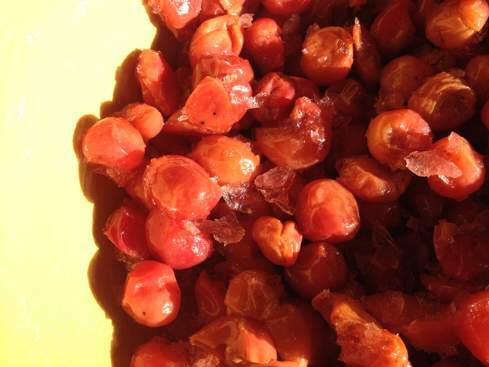 It was a good sour cherry season here at the farm so the freezer is full of pitted cherries. 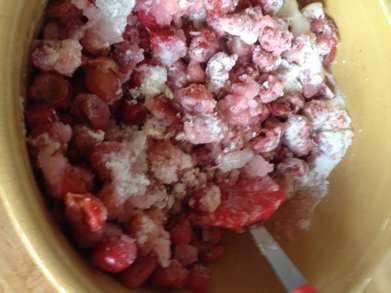 I defrosted some for the pie (Canned sour cherries work great with this recipe as I found out during bad cherry seasons). and got Uncle Ben and Grace to grate some almond paste into the bottom of the crust ( This was my cooking mentor and dear friend Teddy’s trick for amping up the flavor of a pie). 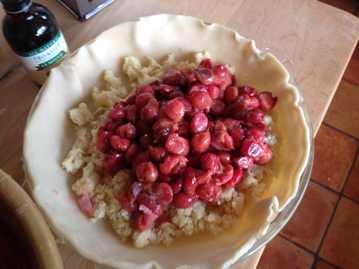 put on a top crust, crimped the edges, cut vents and brushed with egg yolk then baked. I must confess I failed to take any photos of the pies once they were cut into. I couldn’t see the pies over the sea of dishes left to wash after preparing the seven fishes, plus Grace was using my phone. Sheba has been with us for almost a month. Life with this four pound bundle of mischief is an adventure. Here’s my first report on what I am learning. When it comes to Flower Essences for Sheba, all I can say is thank goodness for spritzer bottles. 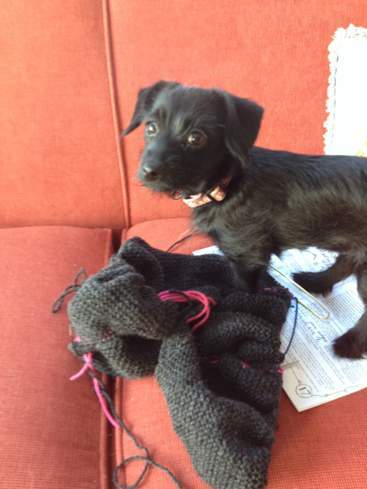 Sheba is a rescue puppy. She needs Flower Essences but doesn’t exactly sit in front of me and open her mouth like dear old MayMay and Riley learned to do. There is just no other way to get her Flower Essences to her other than spritzing over her as she races by. This is actually quite fun as I enjoy her little dance as the Flower Essence spray hits her fur. You know you love it Sheba! 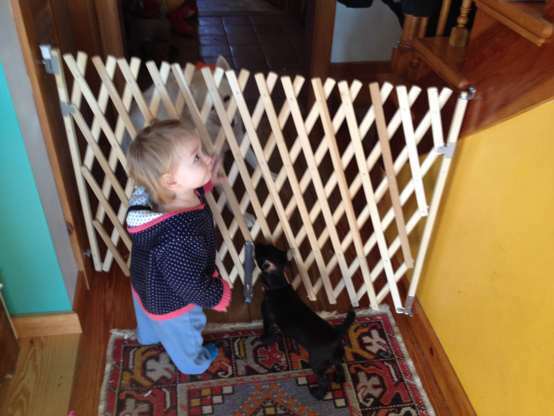 A fifteen month old baby girl and a three month old puppy take mayhem to a whole new level. Sheba and Grace are quite the combination. They think as one. If I turn to see what on earth Sheba is chewing, Grace will dump over a 25# bag of bird seed and begin to spread it all over the kitchen floor. The quieter these two get, the bigger the mess. When both of them are not in the same area, I have to chose my target priority and Grace always wins. Sorry about that Miguel. They were nice shoes before Sheba got a hold of them but Grace heading for the flour bin had my full attention. Here they are trying to break out of their controlled environment to join Reina in a romp for the ages. Sometimes they work the perimeter like the raptors in Jurassic Park. 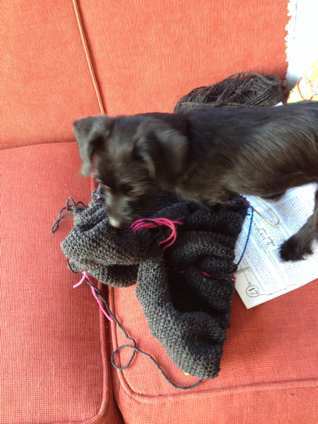 Puppies like yarn as much as kittens and frankly they do a lot more damage than kittens AND a lot faster. This is the before picture. I will spare you the after one. There was a reason people suggested that getting a puppy in winter was not the best idea. 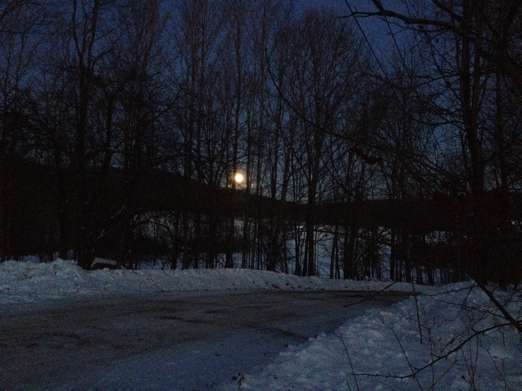 Think 5 am trips outside when it is 20 below and dark! Really dark! On the bright side, I have been seeing a lot of the moon. As so many of you told me, terriers have a lot of personality and I love it. Well maybe some regrets if you are Ben and it is your sweater with the strange holes. It has long puzzled me that the people who work the hardest to be a healing force on the planet are also the ones who get slammed first by the rising vibrational energies of the planet. Somehow I have never been able to quite wrap my head around the fact that those who try to be the most loving actually feel the rising vibrations before people who aren’t so occupied with trying to be their most loving selves. Finally a healer friend shared an image that helped me understand the why of this. Caretakers, healers and those involved in trying to be their loving best are like the head geese in a formation as the formation flies into new territory. 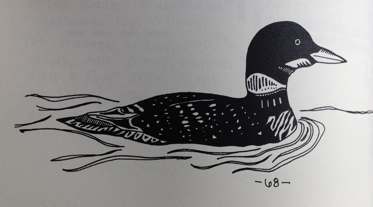 Situated at the head of the formation the head geese shelter others and take the brunt of the headwinds. Like head geese, caretakers take the biggest battering from any shift in energies as they literally push into new territory first so it is not so hard for others to follow. There has been a big amp up of energies on the planet in November and now December. This means caretaker head geese are feeling both tired and perhaps a bit perplexed by the radical contrast between the old energies and the new energies we have all flown smack into. There is something incredibly exhilarating and alive about this new energy we’ve all flown into, but it doesn’t always feel great. At least , not yet. This new energy can feel very disorienting. All activities not grounded in selfless love feel lifeless, while on the flip side, when we are in our hearts and acting from this place of love, everything feels radiant and amazing. But it is a challenge to stay in that love place. We need to be gentle with ourselves when we slip into the disorienting zombie place of old dead illusionary and habitual preoccupations. Let’s face it, this flight into spiritual freedom is probably going to happen in a messy, bumpy way. We are all used to slipping back and forth from heart felt love to ego activities without feeling such an enormous difference in the two states. One always was a state of sleep/illusion and one was always a state of awakeness/love/reality but NOW it suddenly feels that way. There is just no confusing the two states of being. But the thing is, its disorienting to suddenly experience this divide so clearly. Per usual, a big wave of interest in the same Flower Essences by all of you underscored our own sense of this dramatic transition. It reminds us that there are a lot of us trying to creatively and lovingly make sense of this new terrain. The rise in vibration has been quite alarming to many and never before have we sent out so much Red Clover to help people stay calm and not panic. Understandably, if habitual activities and pursuits suddenly feel completely dead to us as in ZOMBIE DEAD, it’s a strange new world. Fortunately, everything is solved by the same activity- centering in our hearts and living and loving from that place- and not only are there are Flower Essences that support us to go there, ALL CREATION supports us to make this leap because our planetary home is now holding this higher vibration. Our Venus Garden Flower Essence combination for this season, Love It and Leave It was created by the Angels and Elementals before we knew we would need this support, and I appreciate the grace of this. We must really let go of all that was and embrace what is. The Angels’ Flower Essence creations for 2013 are just one of many reminders that we are not alone as we deal with this bewildering if amazing territory. We have wise helpers and each other. And the particular helpers from the Angelic and Elemental realms remind us that being a force of love is our only way forward and show us the way through such models as the Flower Essences. Love is the only real thing and in this brave new world, it is definitely feels that way! Q: First of all, what is in this cookbook? A: It is two hundred recipes for everything from breads, soups, salads, stews and casseroles to cakes, cookies, pies and celebratory desserts. I am all about celebrating just about EVERYTHING so there are lots of fun recipes for parties. It is not a vegetarian cookbook, but it does include lots of recipes for fruits and vegetables from the garden. It is not a fussy cookbook or one that sticks to any dietary dogma. These are my favorite recipes for the scrumptious foods we cook all the time. 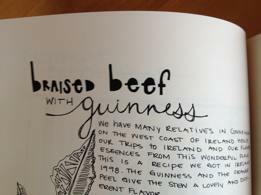 AND every recipes shines because Alli Howe hand lettered and illustrated each page. One other thing in the cookbook is stories. I couldn’t help myself and had to tell some stories about the favorite cooks in my life. Funny stories. This shot is meant to reassure worried meat eaters that there ARE meat recipes in our farm cookbook. Q: What surprised you most about doing this Cookbook? A: As we created the Cookbook, Alli’s art was a daily surprise. A THRILL really! I would hand her off a couple of recipes each night and she would come in the next day with the most extraordinary illustrations for the recipes. 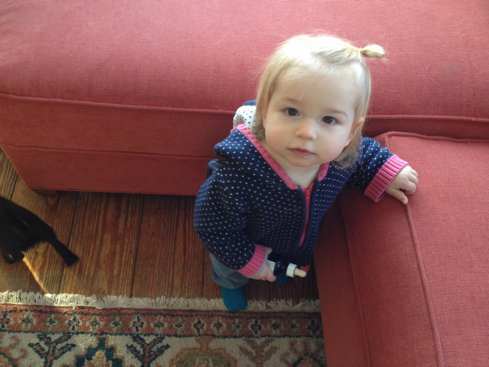 It was so much fun to see each day’s new drawings that I could hardly wait for her to arrive each morning. Every morning felt the way Christmas morning felt when I was a tiny child- there was that much happy anticipation and then complete delight in the one of a kind illustrations Alli had done. 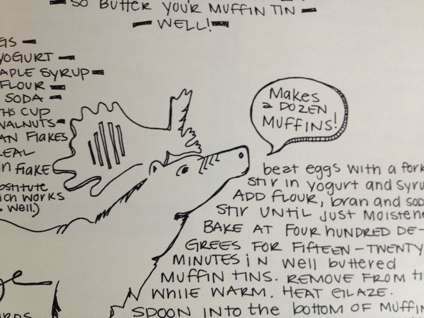 Only Alli would have a reindeer tell you how many muffins a recipe makes! I also found writing this cookbook unexpectedly healing. Like most everyone, I have had a lot of loss in my life, and this was a way to feel close again to some of the people and places I have lost. Telling the stories behind the recipes filled me with wonderful memories of important people in my life like my grandmother Kitty and places like Cranberry Lake in the Adironacks. Q: Why is this a Green Hope Farm Cookbook and not just a Molly Sheehan Cookbook? A; At this point, there is little if any difference between my life in the farm’s kitchen and my life at “work” fifty feet away in the Flower Essence wing. Farms are like that; everything is blended together. While many of the recipes are from meals I have cooked for Jim and our kids, we now have three kitchen tables that get moved around the kitchen depending on our numbers. Often there is a crowd of farm helpers and friends at the tables as well as various family members. I love to cook for anyone who happens through the farm at any time day or night. I see pretty much every day as an occasion to celebrate with good food, so not only do we celebrate comings and goings, birthdays, weddings, milestones of all sorts but often just because we are together. These recipes are the things I cook for all these events. 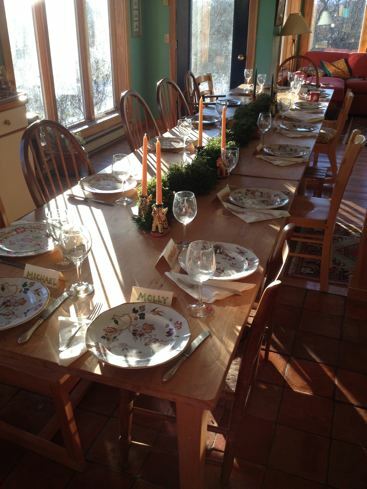 Here are the three tables lined up for Thanksgiving dinner last week. A: Lots are old family recipes, lots are ones friends have shared, many are recipes I made up and lots are from the lovely folks who have worked here over the years. I imagine most groups that work together share food. We just happen to have had a lot of great cooks here who have loved to bring in foods to share. Its been a multicultural group as well so there are recipes from the staff’s original homes in Japan, Costa Rica, South Africa, Lebanon and Cornwall, England. Q: How would you describe your life in the kitchen? A: My grandmother Kitty was a really fabulous cook with a lot of ideas about spices and unusual ingredients. She was the first one to teach me the adventure of food. When I was a child everyone in my family made things from scratch, but as I learned to cook, I took this a little bit further. From a very early age I wanted to grow food in our backyard AND I wanted to find wild foods out in the woods and fields around our home. I made numerous wild harvested meals for my frightened family who just weren’t sure I had identified the plants correctly. 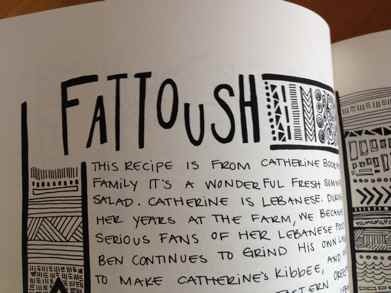 I have included in the cookbook my recipe for Stuffed Grape Leaves which I make using wild grape leaves. That was one dish I made that my parents and siblings loved without fear! 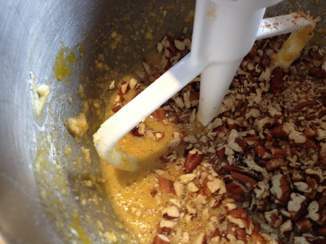 I also loved crafty kitchen projects of all sorts like gingerbread house construction or making my own vanilla extract. When I was first married and teaching English to a bunch of hungry teenagers, I would make them snacks like homemade strudel with strudel dough I had hand pulled or french pastries with puff pastry I had made myself. The more complicated the cooking project the better. One rainy vacation in the Adirondacks, I made homemade croissants for a large crowd of wet relatives nine times in ten days. On the tenth day I made raised donuts. 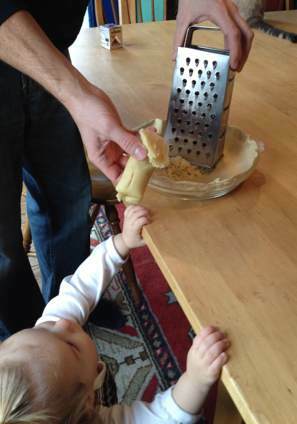 As I raised our four children, I continued to have fun in the kitchen but also learned to streamline my efforts because no kid CARES that the puff pastry was made by hand if the dinner is four hours late. I think the kids would say almost all our food adventures were a success except for the two years I tried to make us into vegetarians. The kids still call those years “the seitan years” though this era did bring us some great recipes we still cook. Q: Why a Cookbook right now? A: For thirty five years I have had an enormous folder of tried and true recipes. 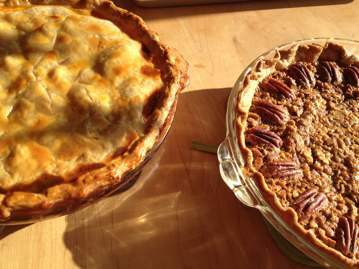 A couple of times I have written up my favorite of these recipes and made a cookbook to share with ten or twenty people. My grandmother gave me the idea for these Cookbook projects as she made a Cookbook her two daughters. 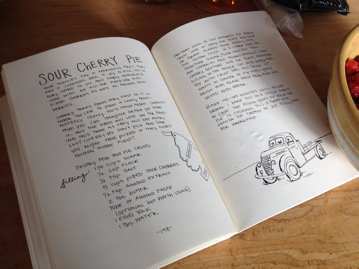 When Alli said she would love to illustrate a cookbook with me, I was excited to create a cookbook to share with EVERYONE connected to Green Hope Farm and beyond. It was a joyful project from start to finish. 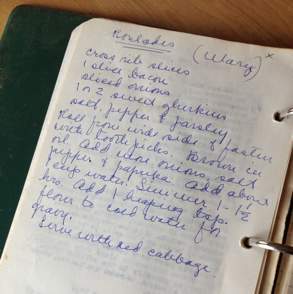 One of my grandmother’s recipes- Her handwriting is very hard to read, so I am glad she typed her original Cookbook, The Copy Cat Cookbook. 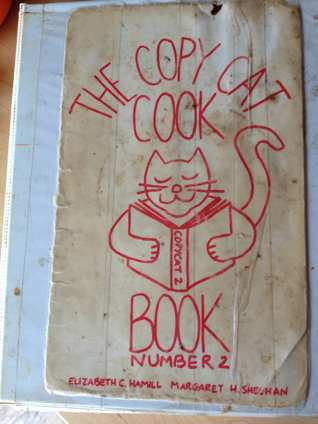 This is the tattered and torn cover from the first Cookbook I did. I only made about a dozen copies and someone stole my sister’s copy from her car. At this point, the stolen copy is probably in better shape than my copy! Jim put all the tattered pieces into a three ring binder for me one Christmas. I seem to be hard on Cookbooks! Q: Any more Cookbook creation in your future? A: I hope so! Right now we are basking in the glow of this gorgeous book. Over Thanksgiving my copy got a workout as we made numerous items from the Cookbook for the crowd of sixteen we had for dinner. I was so glad to have all my favorite recipes under one roof. As far as other Cookbooks. I would love to do another one with Alli. It was a blast to work with her! 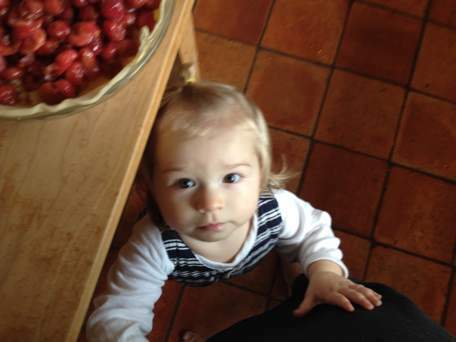 We have talked about doing one focused completely on the fruit and vegetable bounty of the farm. Today I realized it would also be really fun to get all our Green Hope Farm friends to send in their favorite recipes for a Cookbook created by all of you. It would be so fabulous to taste test all your submissions! We had quite a delicious summer re-checking our own recipes!!! 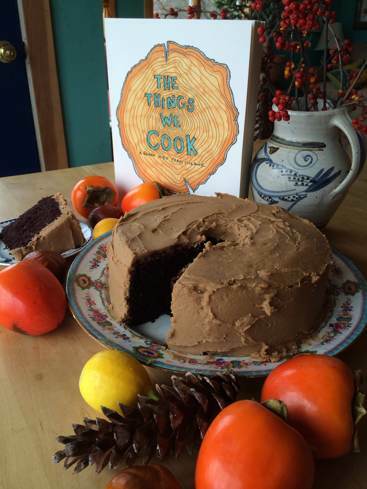 Time will tell but in the meantime, we are so happy to share this Cookbook with you all!